Most people would consider the deaths of 1.3 million civilians a holocaust. We in the USA hardly hear of the toll our two wars in Iraq and Afghanistan have taken on civilians there. 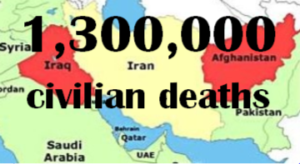 But according to a long and detailed study by the Physicians for Social Action, this is the number of civilians killed there and in Pakistan by those wars. And this does not count people injured. It is little wonder that Muslim countries look with disfavor on US military intervention in their territory—and in fact, do not like the USA at all. 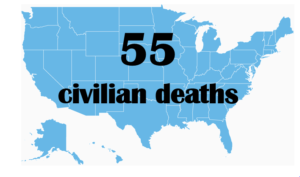 the end of 2015 there have been exactly 55 American civilians killed through Islamic terrorist acts. To put this in perspective, it is estimated that this is about the same number of people who have been killed by having a piece of furniture fall on them. 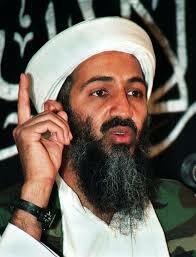 From a military standpoint, our retaliation against Al Qaeda cost vastly more American lives than Al Qaeda destroyed. Furthermore, these costs have not yet been paid for. It will be our children who pick up the tab. What have we gained for this huge price? In Iraq these wars created ISIS. We got rid of a brutal dictator, but one who was not a direct threat. In his place, our misguided fixation on democracy, which ignored the power dynamics in Iraq, put the majority Shiites into power who used it to slaughter thousands of Sunnis. This has polarized the nation even further and allowed ISIS to emerge. In Afghanistan the Taliban remain a force. But we weakened it enough so that ISIS is now moving in, seeking to establish dominance there—as it does wherever it sees weakened states. So does this war policy make sense—or was Osama Bin Laden right? Is this a misguided refusal to accept the realities of the world and the limitations of our own power? I am not advocating a capitulation. There is a way out of this quagmire. Limited military action can help. But it cannot be the whole solution. There are other things we can and must do. The first step is to understand something about Islamic civilization and what it is going through now. We will never deal with the threats of its extremists if we don’t understand them. That will be the subject of subsequent papers. Full transcript of bin Laden’s speech in Aljazeera, http://www.aljazeera.com/archive/2004/11/200849163336457223.html, last viewed 2/24/16. This entry was posted in Basic Articles. Bookmark the permalink.